LAP-Related Data Fields - RH-SPORTS Website! In a lot of applications where it makes sense (e.g. Running or Cycling App Professional), a LAP support is provided. In order to use this feature, please configure the proper LAP mode and freely assign the LAP specific data fields in the 2-, 4- or 7-Field data pages according to your personal needs. Manual Mode In this mode the LAP number increases each time when you manually press the <BACK> or <LAP> button on your watch. The feature only works when the training session is in running or auto-stop mode. 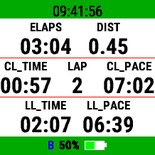 In this mode the LAP number increases automatically when the user-configured distance (separate configuration) is reached. The feature only works when the training session is in running or auto-stop mode. Use a 7-Field Data Page to have all your LAP information as well as other useful information in one single data page. Please click here for a description how to configure data fields. Use a 2-Field Data Page to show the LAP number and other useful information and a 4-Field Data Page to show the LAP specific data like current and last LAP time and pace. Please click here for a description how to configure data fields. Use a 2-Field Data Page to show the LAP number and other useful information and a 4-Field Data Page to show the LAP specific data like current and last LAP distance and speed. Please click here for a description how to configure data fields.